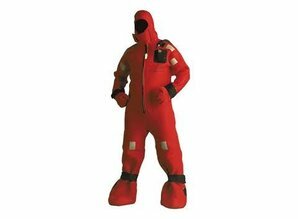 Stearn's I590 SOLAS Cold Water Immersion Suit provides quality anti-hypothermia protection. It features 5mm stretchable flame retardant neoprene, a face shield for spray protection, insulated glove, inflatable head support, ankle and wrist adjustments, and light pocketand durable non-slip soles. All sizes provide a generous fit for easy donning. Includes lifting harness and buddy line.